Flavors range from Earl Grey with bergamot orange to a blend inspired by a Tibetan monastery recipe. Grab your pith helmet and your traveling pants, because your own teapot is now your key to international adventure. 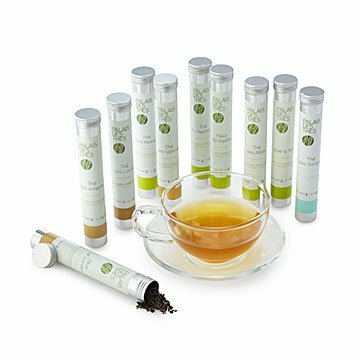 This sampler set of teas from all four corners of the globe comes with ten distinctive varieties, each packaged in a tube with enough tea for a standard 6-8 cup pot. The flavors range from familiar with a twist, like Earl Grey with bergamot orange, to more exotic infusions, such as Thé des Moines, a floral blend inspired by a recipe from a Tibetan monastery. With each pot, you can sit back and relax while your taste buds enjoy a well-earned vacation. Teas sourced globally and blended in France. Looking for more exotic teas? Check out our Teas from Around the World set. Part of a Mother's Day gift with a tea infused, my mom really loved both and raved about the gift (and boy is she picky!). She told me she can't wait to try the teas.